Easily Beat The Heat With This Cool Ice Tray - Great for Parties, Summer, Restaurants, Entertaining in the home, Holiday Entertaining and Holiday Gifts. Makes four stylish, elegant looking ice balls at a time and releases easily from the silicone ice mold tray without cracking. Dishwasher and Microwave Safe - makes it easy to clean and reuse. 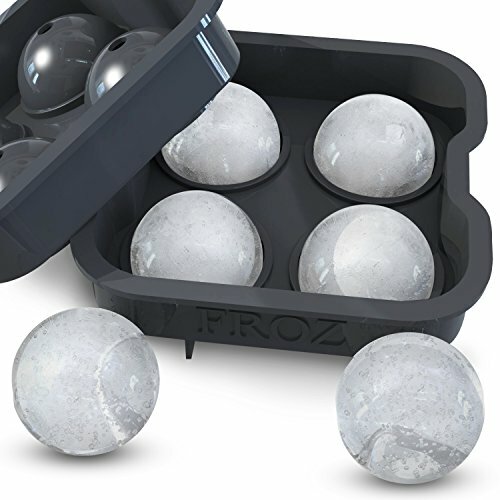 FROZ Sphere Ice Mold is gorgeous, has professional-grade quality with leak-proof design that makes perfectly seamless ice balls! 100% Lifetime Guarantee. This Durable Ice Mold Tray Stacks Neatly in the Freezer and keeps your refrigerator organized. It is also leak-free, easy to fill, does not crack while freezing and won\'t tip over in the freezer. Perfect size ice balls for whiskey! Cubiteras correctas y de buena calidad.